After completing the Baby Door Hanger, I needed to package it. A box was too bulky. So I searched for just the right bag to go with the nursery animal prints used on the card and door hanger. It needed to be babyish, yet still an animal. For anything custom, I usually end up making something. This time, I found the perfect little MONKEY! Isn't he cute! The painted wooden monkey is from Michael's. 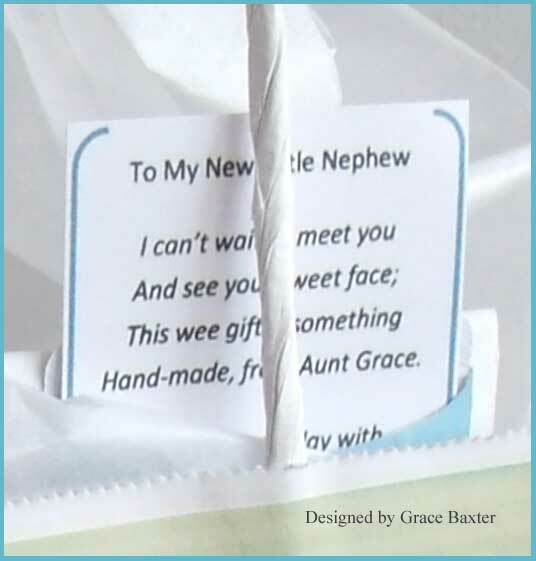 In styling the bag, I made another title strip like the one used on the Baby Shower Card, HERE. Then I cut some big jungle leaves and a branch for our monkey to be swinging on. As Mary (from Cardz TV) would say, "It's just so stinkin' cute!" Leaves and branch are from Sweethearts cartridge. Now I needed a tiny gift card for this package, otherwise in the shuffle of so many gifts, the expectant mommy wouldn't know who it was from. I made a tiny aqua envelope from the same paper as used on the shower card. Then I composed a little poem and printed it as an insert that fit the envelope. When you’re trying to sleep! 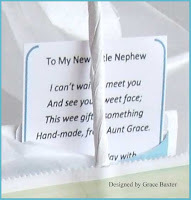 These three baby shower items (door hanger, card and gift bag) were so much fun to make. Don't you love it when it all comes together? 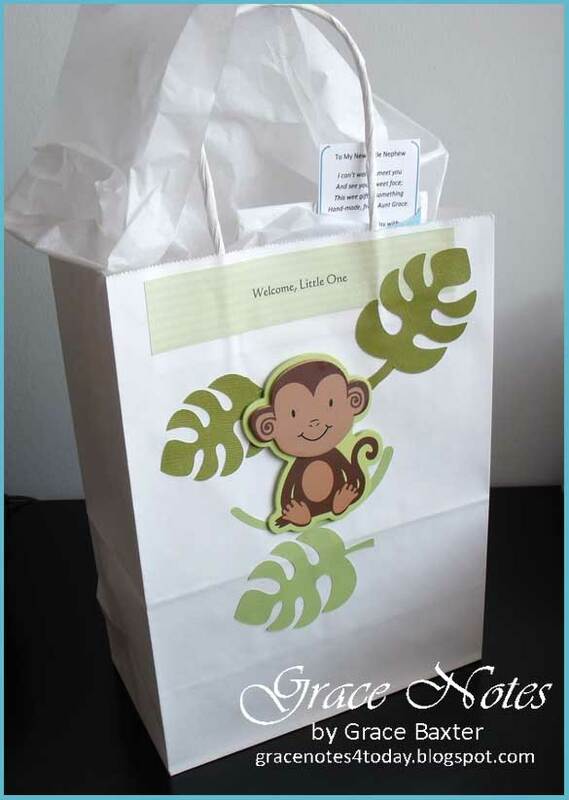 such a sweet gift bag! Super cute decorated bag. The colors and images look great on the white.